I recently gave an old lamp a bit of a makeover so that it was snazzy enough to put in my daughter’s room. 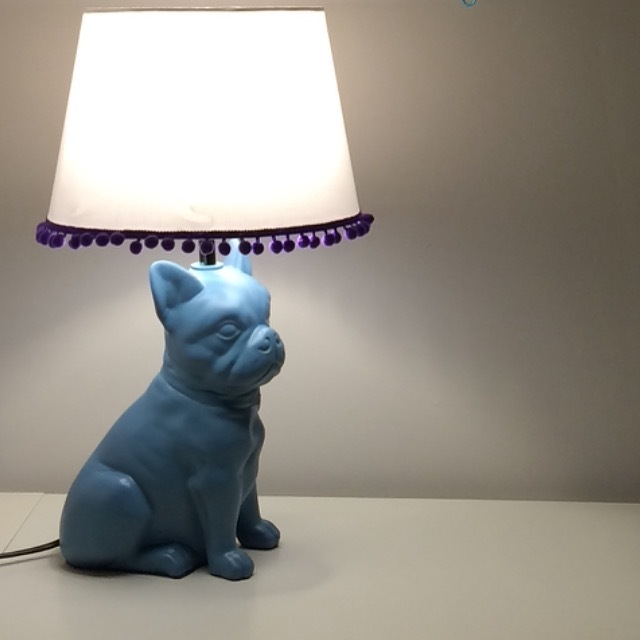 I quite liked the result so thought I would share my very easy lamptastic makeover with you in case you have an ugly animal lamp and want something to do whilst watching TV. A lamp. (obviously) Here is the lamp ‘before’. It’s a black ceramic dog with a black shade. I liked it when I bought it however it just isn’t for me anymore! Doesn’t really scream ‘baby girl’s room’ but it has potential! Spray paint (not pictured as I had no intention of blogging this until I realised how fantastically edgy my dog turned out and wanted to share). I used B&Q Colours in ‘blue ocean’ which actually came out a teal-ish colour. It was about £6. A shade. I used an IKEA JARA which is about £2. Some pompom trim. Mine is purple and £1.99/m from Dunelm. I love pompom trim! Using a plastic bag or newspaper, carefully cover the bulb holding top part of your lamp. Then take strips of masking tape and cover the lead. This is so that spray paint doesn’t get in any nooks and crannies that you wouldn’t like it. Nice and neat. Next we are going to take it outside. Set down some newspaper and in a well ventilated (preferably outdoor) space start to spray paint the lamp. Make sure you shake the can well before painting. Also I find it best to do several thin layers and gradually cover the lamp rather than one thick layer that runs and drips. Leave to dry. I left mine overnight. Taking your lampshade, run the pompom trim around the base so you can measure approx how much you will need. Apply the fabric glue in sections of around 3 inches and press the trim firmly to the glue. This will need to be left to dry fully. Once your lamp and glue are dry, remove the masking tape protection and attach the shade. Hey presto! Brand new fabulous lighting!